Although I've been a strict pocket diaper mama from the start, I'm finally starting to branch out a little bit. A friend gave me a stack of Goodmama diapers when I was complaining about how thick Sugar Pop's BumGenius diaper was with the microfiber inserts (really only an issue when they're tiny, now at 5 months, they don't look that puffy anymore). While the Goodmama diapers are wonderful and luxurious and made of amazing fabrics, I didn't love the fact that the potty was held against Sugar Pop's skin all night. I much prefer how a pocket diaper pulls the liquid away from his body and locks it safely away behind a layer of microfiber. 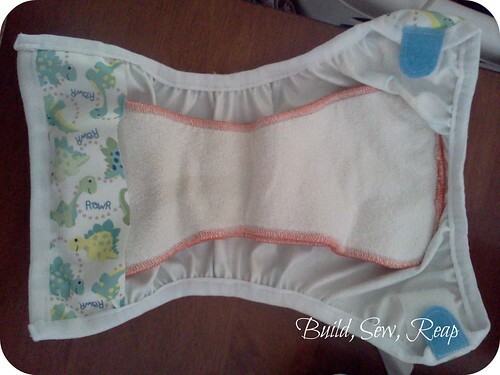 Then I discovered that their snap-in inserts were great daytime stuffers for my pocket diapers. Knowing they were thin but absorbent, I wanted to do even better than stuffing them (plus I'm always looking for an excuse to make more diapers for the little dude). I created a diaper cover like the ones you can put a prefold into but I added snaps so I could snap in the Goodmama inserts. They're slim and trim and I was able to use some scraps of PUL that weren't big enough for my usual CushyBum pocket diapers. I'll admit that the potty isn't locked behind a layer of microfiber but by only using the insert from the Goodmamas, it isn't absorbed and spread to his entire lower region, merely along the center strip of fabric. Here's the basic outer portion. The edges are finished with a simple fold over elastic (FOE) so this whole diaper came together in about 30 minutes. I also made it a bit long from front to back so for now it is snapped down to a smaller size. I love having snap pliers to add this kind of functionality. This diaper will fit him for a long time. Here it is with the Goodmama insert positioned. 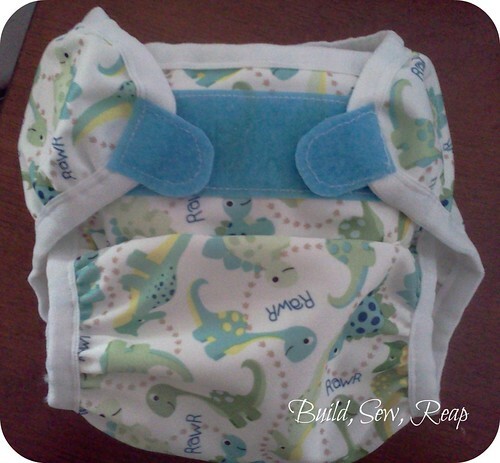 When I tried laying these in a regular diaper cover, I often found that the back slid to one side or another. It was still contained so it wasn't a huge problem but I feel more confident in the diaper when everything is where it should be. And this is how the insert stays in place. The Goodmama insert already had snaps to stay in the main part of the GM diaper so I just added a couple of snaps to my own diaper cover and stuck them together. When I throw this diaper in the wash, I don't have to take it apart, I just put the whole thing in and since it is multiple layers just snapped together at the back edge, everything gets really clean and the diaper is ready to be used fresh from the laundry - no stuffing or assembling. I love the simplicity of it! !